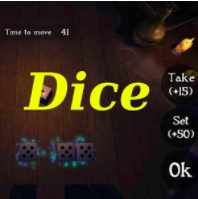 If you think that you’re just one Shillelagh short of being a full blown leprechaun and want a test to prove just how lucky you really are then check out the new dice-style Android game, Bones Game Online! This game of chance let’s you play a time-old board game against a bot or a real person to determine if Lady Luck is really on your side. There’s not a lot skill to this game – just pure luck – so your going to have to rub you rabbit’s foot and load up on heather if you want to get ahead in this game! You don’t need any experience to excel at this game, however, you will need to take some time to understand the rules. The main objective is to get 1,000 points. You and your opponent take turns rolling dice to see who can get the most points first. These balanced rules means no one has more of an advantage, so you can just see which person is luckier on any given day. To play, you do need a basic understanding of some poker terms (like straight, flush, three of a kind, etc.). To start the game, you each have to throw a bone (or roll one dice). Whoever gets the higher point gets to start the game. Each time you roll the dice, you see what combination of points you can get to gain the most points. The many different combinations of rolls result in different points values (for example: a three of a kind is 20 points, a flush is 80 points). As soon as each player gets 70 points, the results can start being recorded, and the true tournament will begin. There are tons of benefits to playing Bones Game Online. You can tempt the fates and try your luck rolling the dice each round to see if you can beat your opponent. There are also some cool visuals of a wooden table with food on it under a candlelit glow, so you’ll feel like you’re back in time at a medieval table, eating with your friends. The game also goes at a super relaxed pace and doesn’t feel rushed at all, so you can feel more at ease while you’re playing. However, the rules can be a little tricky to understand at first and remember all the different points values can get difficult. Also, because the action is slow and you can’t move the game along any faster, you might get stuck waiting for the bot or player to make their next move. If you’re looking for a game to truly test if lady luck is on your side, you can download Bones Game Online for just $1.19 on Google Play.